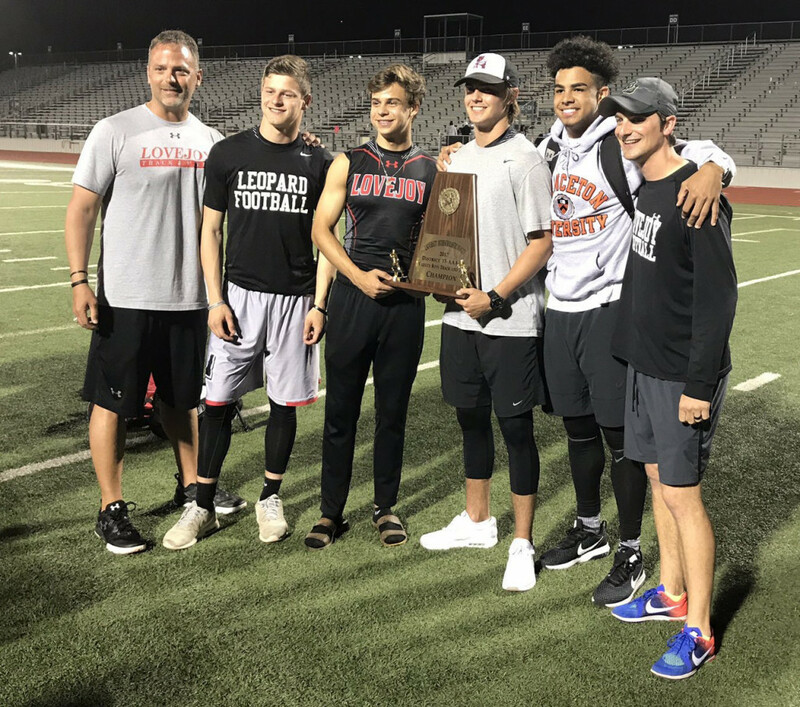 The Lovejoy Leopards boys’ team scored points in each event at the District 15-5A Track and Field Championships to win the school’s first-ever Boys Track and Field Championship. The Leopards scored 180.5 points overall, outscoring Mesquite Poteet (128 points) by 52.5 points. Highland Park finished 3rd with 113.5 points, followed by Wylie East (54 points), Royse City (46 points), North Forney (40 points), Forney (30 points), and West Mesquite (30 points). Ryan Brands won the 3200m with a time of 9:44.83 and the 1600m with a time of 4:31.18, Chase Van Wagoner won the 100m with a time of 10.98 and anchored the 4x100m relay team of Beau Iovinelli, Jake Chamberlin, and Landon McDermott, once again setting a new school record with a time of 42.12. Chamberlin was also a winner in the 400m with a time of 49.33. For the fourth time this season, Colin Engbrock cleared 14′ in the Pole Vault, winning the event. Jeremy Young cleared 13’6″ for 2nd place, and Dylan Neitsch cleared 12′ to finish 6th. Chase Van Wagoner jumped 22’3″, to win the Long Jump. Tyler Van Wagoner and Jack Victor finished in a three-way tie for 3rd in the High Jump, clearing 5’10”. Victor qualified for the Area Meet by clearing 5’10” a second time during a tie-breaker. James Rainey finished as runner-up in both the Shot Put (47’2.25″) and Discus (129’11”) and Nathaniel Finch finished 6th in the Shot Put with a distance of 43’3.5″. Overall, the Leopards had 22 of 26 athletes score points, 17 athletes (including all relay teams) qualified for the Area Meet in 15 of the 17 events, won 5 of the 11 running events, 2 of the 6 field events, and broke 1 school record. The Area Meet will be held at Lovejoy High School on Thursday, April 20th.